I knew this was coming, so when we were with Jamey's parents this past weekend (they kept Sam and Sadie while we went to my Grammie's services) I asked my sugar-snap/snow-pea-expert of a mother-in-law how she fixes hers. I knew what they tasted like, yes indeed. They taste heavenly. What I did not know is how she makes them that way. I followed her expert advice and what you'll find below is how I went about making them per her instructions. Jamey said they turned out just right. There is something wonderful about fresh peas...they taste like summer- while you still like summer, that is:-). Use the freshest peas you can get your hands on. If you are lactose or gluten intolerant, you can skip the creamed part altogether- they will still be delicious. 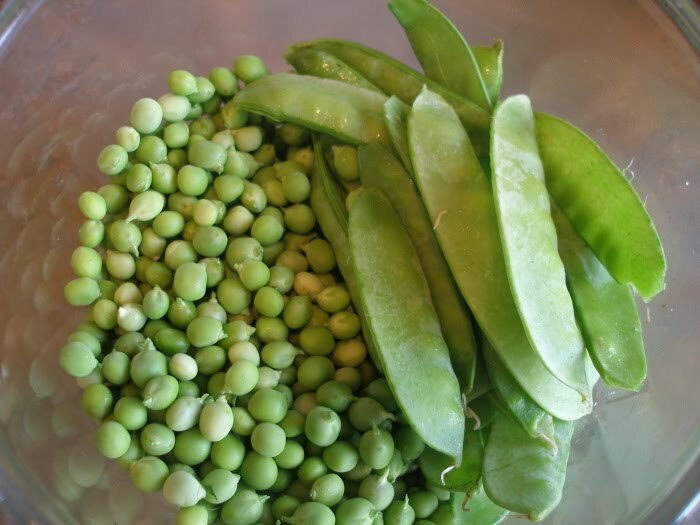 A word about sugar snap and snow peas: You don't shell either of them like you do garden peas, instead you leave the peas in the pod and eat the whole pod. You do need to take off their "strings". To do this, snap off the very end of the pod, where it was attached to the plant and pull down tearing off the tiny string that runs down the edge of the pod. Do this on both sides. You're not trying to open the pods, just remove the string which can be chewy. Young pods may have little or no string. They really are sweet, hence their name. 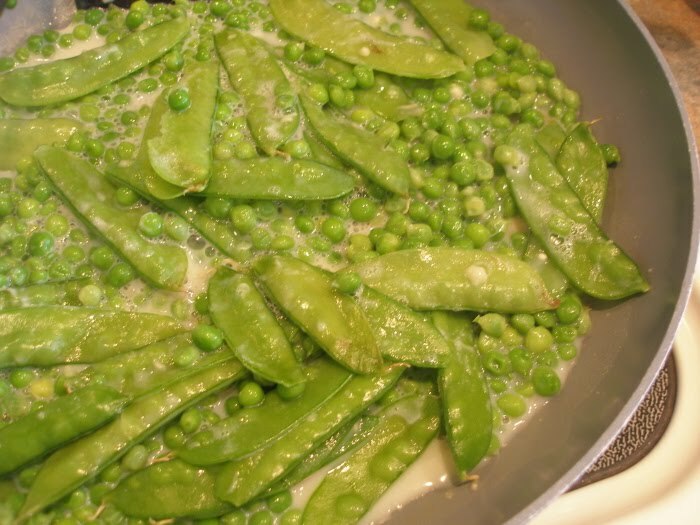 Place your washed peas in a shallow pan or skillet and add enough water to cover the bottom half of your pile of peas. Sprinkle sparingly with salt, turn the heat on high and cover. Bring the water to a boil and stir occasionally. The peas will turn a lovely bright green. Do not let all the water evaporate- add more if you need to. After about 5 minutes of cooking, turn down the heat to low. Add enough milk to cover the bottom half of your pile of peas. Now, move the peas to one side and add a couple tablespoons of flour, blending it in well with the milk. Incorporate the peas, cover and continue to cook over medium heat for another five minutes or until the peas are done. Add a little more milk if the pan starts to get too dry. Sugar snap peas and snow peas are done when they are very tender- you may need to do a taste test (bummer). At this point, some of the pods may split open. Season with more salt and black ground pepper and serve. Mavis, I checked my handy Food Lover's Companion and wouldn't you know sugar snap peas are a cross between an English pea and a snow pea?! Snow peas can be eaten raw, used in stir fry or, similarly to sugar snap peas, steamed until soft with a little crispness left. So, yes! I think you should try it:-). 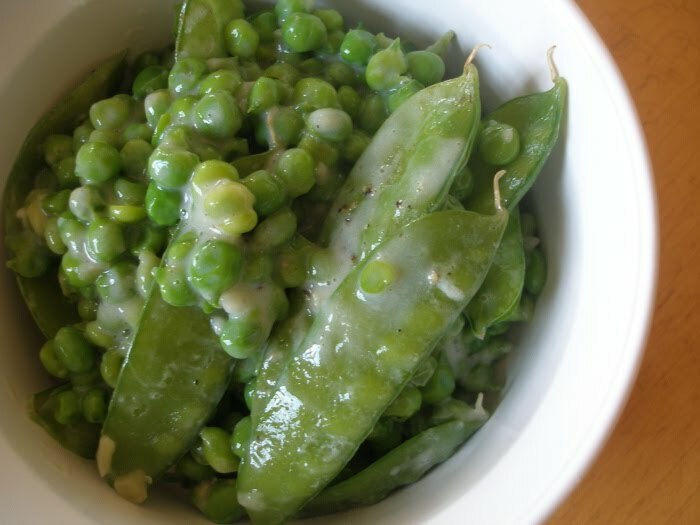 Mmm, creamed peas are one of my favorites! My grandmother used to make them with the little baby onions. So good... I'm sure they were frozen...becuase that's how my family did things...but I'm liking the fresh way for MY family! Okay... thanks Little Miss Looker Upper of all things food related :) I think I will make this for dinner tonight along with a big bowl of rice. I'll let you know how it goes. I like this - it's different from a classic white sauce and so clever to do it right in the pan. I have a bowlful of English peas in the fridge, so I think I'm going to do it. Funny. We think we've actually grown snow peas, not sugar snap peas. No matter- you fix them the same- I've adjusted the post above so it's accurate.